New Delhi, April 7, 2017: Gurgaon-based Twenty Two Motors Pvt Ltd has raised $1.6 million in its pre-series A round funding led by Mr. Ishwar Singh, CEO, Haryana Industries. Mr. Farhaan Shabbir, former director of Harley-Davidson also joined the investment round to further strengthen his belief in the start-up company he joined as a founding member. Twenty Two Motors was incorporated in August 2016 by Parveen Kharb & Vijay Chandrawat with the aim of making cutting edge EV technology affordable for the current generation. The Company promises to deliver India’s first truly smart scooter to the masses in Q1, 2018. “Tremendous work has been done in the prototyping and developing of the highly effective EV since our launch. We have been able to attract the seasoned and quality talent from major Auto companies. Major hurdles of developing Lithium-ion battery, battery management system & smart electronics has also been resolved. This investment is an acknowledgment of our belief that we are working on the product for future generations,” said Parveen Kharb, Co-founder & CEO, Twenty Two Motors. Lithium Ion battery pack and BMS has been developed taking into consideration Indian temperature profile and thus optimizes performance and battery life. 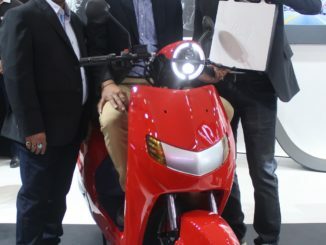 Smart scooter will be fully IOT compliant having devices like GPS, GPRS, Gyroscope, accelerometer etc making it virtually theft proof. Data from these IOT devices is being decoded by servers by using Data mining and Artificial intelligence techniques to precisely determine to ride behavior of the user. A user is always connected to scooter via mobile application which can also be used to control scooter access remotely. Scooter information is available on the cloud and hence all the troubleshooting and other service can be managed automatically. “Investment will be used meticulously to build and prove the product apart from strengthening startup’s human resource capabilities. Broadly, Investment will be channeled for Prototype vehicle development, Testing, Strengthening Team, Component Development and Factory Setup. Investment certifies our potential and is expected to provide exponential growth to the company,” comments Vijay Chandrawat, Co-founder & COO, Twenty Two Motors. “We have strategically invested in TTMPL as we could find synergies between both the businesses. Industrial house will gain insights in EV domain while Twenty Two Motors will have increased capabilities to shorten their product development cycle, said Ishwar Singh, CEO, Haryana Group of Industries, a leading automobile component manufacturer across the globe. Parveen is an automation engineer and automobile insider having 15 years of entrepreneur experience in Automobile domain. He started and is successfully running his two other ventures JMX works and QCD engineering. While Vijay, a computer science graduate from IIT Delhi, has around 14 years work experience in technology, strategy and operations domain. Both forged a real good partnership as one having automobile domain expertise while other having technology expertise. What binds them together is that they both are technology enthusiast and thus taking Electric Vehicles’ challenging road ahead motivated them. About Twenty Two Motors Pvt. Ltd.
Gurgaon based startup, Twenty Two Motors Pvt Ltd, forayed into the electrical vehicle (EV) domain in August 2016. Company is brainchild of Mr Parveen Kharb and Vijay Chandrawat. Moved by the success of Tesla in USA and technological challenges, both decided to pursue their heart and take up the uphill task of indigenous development of EV technology in India. Current EV available in India and most of the new one, are not making EV Affordable and Fast. The company took this as a challenge and has successfully developed its core technology platform consisting of Lithium Ion Battery Pack, Battery Management System and Smart Electronics. The company plans to launch its first vehicle to masses in Q1, 2018.